Four-try Will Bate was the star of the show for Alcester. 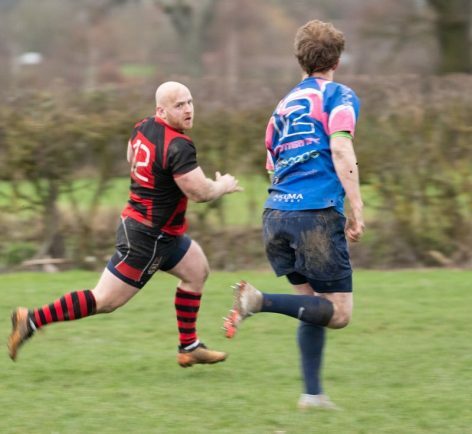 ALCESTER sealed a season double over local rivals Shottery as an emphatic second half performance led to a ten-try blitz of their opposition in Saturday’s friendly. Guest player Will Bate stole the show in scoring four of the home side’s tries, with Sean Sudworth converting six. However, the Stratford visitors dominated the early period of the game, retaining the majority of the possession which was rewarded with a try under the posts. It was not long before Shottery were back in front after a loose ball was kicked ahead and the Shottery player won the chase to it and dived over the line out wide. The game continued to be end to end and, after a fine spell of possession and a series of forward drives up the slope, Alcester’s Mat Ashby crashed over. Less than ten minutes later, Ashby crossed for his second try after Bate put in all the work, crashing through several tackles to offload to his team mate to put Alcester 17-12 ahead after a Sudworth conversion. An ex-Alcester player, Ed Benskin, was next to demonstrate a piece of individual brilliance. He dodged his way out of several tackles from within his own half to make it to the whitewash. Benksin completed the first half flurry of tries with his second after the ball was moved out wide for the winger to score and put Shottery 24-17 ahead at the break. The home side were able to utilise their large squad and made six changes at the break, particularly in the front five which brought about a complete change for the second 40 minutes. Josh O’Connor, who had come on as a replacement, opened the scoring in the second half to draw his side level with their opposition. Bate scored again to secure his hat-trick – a great debut performance from the northerner. Bate continued to impress and, being no stranger to the whitewash, he was able to find it again for his fourth and final try. Alcester’s guest players controlled the game with Harry Leek scoring the home side’s seventh try. The team’s youngsters Lewis Walker and O’Connor closed out the game with a try apiece. On Saturday seventh-placed Alcester travel to Ledbury, who are three places above them in Midlands Three West (South), and the 2nds host Coventrians 2nds.